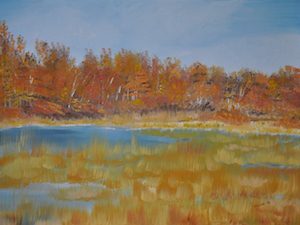 Rye (NY) artist Meera Agarwal’s oil painting “Fall for Marshlands” has been juried into a group art exhibit – Art at the Ferguson – FALL FANTASY (Meera Agarwal’s painting was Awarded 3rd place overall. First in Painting). Meera Agarwal was awarded 3rd place.